The end of one calendar year and the beginning of another is a good time for me to look back and consider how I have grown through the year. That means looking through the blog posts of the past year and seeing what I have been thinking and writing about in 2012. After a quick perusal I came up with the following top-ten list. These are a few of my favourite posts in a, close to, tenth to first favourite order. 10. Our Time is a reminder of how grateful I am for the incredible blessings of my life. Thank-you Father for the place and time in which I live. 9. Don't Miss Your Life is the title of a song that came out on Father's day last June. It reminds all of us of the important things in life. 8. Prayer Changes Things is a bit of a confession that I am an experimenter at heart. The three styles of prayer represented in this blog show how I have spent a life-time in the laboratory of prayer. 7. Observation is all about science and the mystery of how God has put the universe together. 6. Contact is another excursion into exobiology and musings about the expanses of our universe. It reminds us that both theology and science must search for truth. 5. Dark Knight shows how deeply God has built self-sacrifice and resurrection stories into the fabric of our culture. 4. Adam and Genetics celebrates the completion of a degree and introduces a controversial yet widely held perspective on genetics and theology. 3. Higgs and Bosons pays homage to the biggest scientific discovery of the year and what certainly should have been the newsmaker of the year (contrary to what you will read about the Canadian Press newsmaker of the year). 2. Spiritual Inertia is short and to the point but reveals a quote that finally gave me the language to describe a principle of spiritual growth that I have experienced all of my life. 1. Pacing the Cage relates the lyrics of Bruce Cockburn's classic song and reminds me that I can never rest on yesterday's successes. Next year I will continue to seek to grow and develop as a person and a writer. Together these blog posts show the spiritual journey of 2012 but there is one more event that has changed the man I am. This is also the year in which our first grandchild was born. He is certainly one of the best things that has happened to us in this year; and in our lifetime. Spending Christmas with him and his parents, cuddling his ten pound body into my shoulder, and praising God for his birth have been a beautiful way to end 2012. His small body reminds us of another tiny baby who came into the world with "fragile finger sent to save us; tender brow prepared for thorn; (and) tiny heart whose blood will save us. "1 May our memories of 2012 help us become the people whom God is calling us to be. Happy New Year. 1. Chris Rice, "Welcome to Our World." We have been enjoying a wonderful Christmas season in Simcoe, Ontario with our daughter, Twila, son-in-law, Brad, and grandson, Clayton. Yesterday, we had the opportunity to go to Sunday worship at the Selkirk Christian Chapel in Selkirk, where they attend and are loved by a great church family. Brad, Twila, and I performed this Chris Rice song at the Sunday morning service. As you read these amazing lyrics you will notice that they describe the mystery of a baby born for the purpose of dying for every human who has ever lived on earth. Welcome long-awaited Holy Stranger; welcome Holy Child; welcome to our world. Merry Christmas to all who take the time to read this blog. May your Christmas season be filled with love, grace, peace, family, and friends. May you continue to hunger and thirst for righteousness. I am guest blogging on the Cosmos site. Add the Cosmos blog site to your regular reading and enjoy a re-blog of a recent Thirst post. Christmas reminds us that God's great endings come from His humble beginnings. Paul Valdemar Horsdal, known professionally as Valdy, is a Canadian folk musician who has been writing songs and performing for more than forty years. I remember discovering his "Country Man" album in the seventies and the couple of times I saw him in concert I was amazed with how this one man and his guitar could keep an audience engaged for hours. He is also one of the original artists who spoke out against the damage humans were causing to our environment. His song entitled "MM-MM-MM-MM" is all but forgotten now (perhaps partly owing to the strange title) but has a great message of warning. The song envisions a future in which air pollution has reached such extremes that the people of earth have never seen the sun in the sky. In 1972 this was a vision that was easy to imagine. Due to the work of environmentalists and folk singers, air quality in such cities as Los Angeles has vastly improved since the seventies but air pollution is still a major health concern in rapidly developing cities such as Ulan Bator, Mongolia. Valdy's words are still an important warning to the people of our planet. I looked for these lyrics online and could not find them so I offer them here in this blog. As a follow-up to Saturday's blog entitled "Observation," I offer the following quotes related to science and observation. The first two are equally true although in tension with each other. [Those] who have an excessive faith in their theories or in their ideas are not only poorly disposed to make discoveries, but they also make very poor observations. - Claude Bernard (1813-78) French physiologist, 1865. The dispassionate intellect, the open mind, the unprejudiced observer, exist in an exact sense only in a sort of intellectualist folk-lore; states even approaching them cannot be reached without a moral and emotional effort most of us cannot or will not make. - Wilfred Batten Lewis Trotter (1872-1939) English surgeon. Sherlock Holmes, although fictional, is a great proponent of observation, data, and theory - in that order. It is a capital mistake to theorise before one has data. Insensibly one begins to twist facts to suit theories instead of theories to suit facts. - Sherlock Holmes, the fictional creation of Arthur Conan Doyle (1859-1930) British physician and novelist. George Santayana offers this definition which seems to agree with my own sentiments. Science is nothing but developed perception, interpreted intent, common sense rounded out and minutely articulated. - George Santayana (1863-1952) U. S. philosopher and writer. The Life of Reason. Lastly, Voltaire has this witty comment. Common sense is not so common. - Voltaire, a French Enlightenment writer, historian, and philosopher. Because I have studied science most of my life, some people will confide with me that they wish they had studied more science. I usually tell them that it is never too late to start. The convenient thing about science is that one can begin studying at any time. Science, at its core, starts with observation and extrapolation. We have all observed that if the wind is coming out of the east then a flag on a flagpole will point to the west. So, we observe a flag and can draw conclusions about which way the wind is blowing. If we notice that a flag ten feet above the ground is pointing one direction and one on top of a 250 foot building is pointing another direction, we can draw some conclusions about the movement of air currents at different altitudes. The world is wide open for this type of observation and discovery. Great scientific breakthroughs happen because someone paid attention to their world. Take a look around you and see what lines of observation might be available to you. Many of us can see the moon rise and set from where we live. Have we really observed the moon? Can you answer this simple question? When the moon is waning, that is, going from full to new moon, which side of the moon is lit up? Left? Right? Another way to ask this question is, "When the moon is waning, does it take the shape of a 'C' or a 'D'?" One should be able to answer this question after just a few nights of observation. If you get good at answering this question you will be able to make predictions about whether the moon will be brighter or dimmer the next evening. It will also allow you to make predictions about tides if you happen to live close to the ocean. The movement of tidal waters is another great source of scientific study. See what you can learn by noticing the direction anchored boats turn in the water at any given time of the day and how high the water is on the shore. What can you learn from these simple descriptions? Another lunar observation that is available to us relates to the direction in which the moon revolves around the earth. You can do some observation over the next few days or weeks to see if you can determine whether the rotation is clockwise or anti-clockwise relative to a view from above the earth's north pole. Here is a hint, you will need to observe where the moon rises in the sky (east, west, north, or south) and the time of moonrise over a few days. Is the time of moonrise the same every day or does it rise later or earlier each day? This was a query posed to me by a tenth grade physics teacher which set me off on a lifetime of observation and discovery. Try not to cheat and look up the answer on the internet. This is where much of present scientific study can falter. We get lazy and do not seek the answer ourselves. Instead, we trust someone else's answer without even seeing the data that led them to their conclusion. There is a group of crows that collect mussels from the seashore close to my house. They have learned how to do a sort of crowish “science.” Once the birds have collected the mussels they must find ways to break open the shells to get at the life-giving meat inside. This hunger, and survival by eating, is the huge motivator for their scientific study. If they drop the mussels from a height onto rocky places, some will break open; but often the mussels will catch too much air and flutter to the ground without making a significant impact with the ground. These crows have observed that if they drop them on the seawall, a walking and biking path along the shores of the ocean, there is a good chance that a human will step on the mussels or run them over with their bicycle. This nicely opens the shells and allows the crows to get their breakfast or dinner of mussels. These crows have become keen observers of human behaviour. They know when the paths are busy and how to use this tool to their advantage. They have also discovered that bicycles are much more likely to break open the shells than are footsteps. Cyclists race along the path and do not even notice that they are running over mussel shells whereas pedestrians tend to step around the shells to avoid the crunching underfoot. In places where the seawall is nicely divided into a cycling path on one side and a pedestrian path on the other side, one can observe approximately ten mussel shells on the bicycle side for every one mussel shell on the pedestrian side. Crows have learned probability. Presumably, the crows that do put the odd shell on the pedestrian side also know that occasionally the tourists do not pay attention to the segregation of bicycles and pedestrians; and cyclists will sometimes ride on the pedestrian path. Vancouver has massive murders of crows that fly through the air at predictable times. Every evening, about a half hour before sunset, they fly past the windows of my home. I am not sure how long it took me to come to this conclusion but it was a natural one as I noted the murders of crows, the time of day, and the amount of light at the time. They are expert at flight and use the currents of air to their great advantage. I am sure I could learn several things about the weather and bird behaviour if I took the time to chart things like wind speed, wind direction, relative humidity, temperature, speed of the birds and altitude at which they fly. Science is very egalitarian. It makes itself available to all. This quote by Eugene Peterson fits well with my own thoughts of the last few days. Before it ever crossed our minds that God might be important, God singled us out as important. Before we were formed in the womb, God knew us. We are known before we know. This realization has a practical result: no longer do we run here and there. Our lives are not puzzles to be figured out. Rather, we come to God, who knows us and reveals to us the truth of our lives. The fundamental mistake is to begin with ourselves and not God. God is the center from which all life develops. If we use our ego as the center from which to plot the geometry of our lives, we will live eccentrically. All wise reflection corroborates Scripture here. We enter a world we didn't create. We grow into a life already provided for us. We arrive in a complex of relationships with other wills and destinies that are already in full operation before we are introduced. If we are going to live appropriately, we must be aware that we are living in the middle of a story that was begun and will be concluded by another. And this other is God. My identity does not begin when I begin to understand myself. There is something previous to what I think about myself, and it is what God thinks of me. That means that everything I think and feel is by nature a response, and the one to whom I respond is God. I never speak the first word. I never make the first move.1. It occurs to me that if we start with ourselves and extrapolate to God, we end up with a superhuman, a god made in our own image. If we start with God we find that we are marked with his image. We end up with little creators. 1. Eugene H. Peterson, Run With the Horses (Downers Grove: InterVarsity Press, 1983), p. 38. Once we begin to think about our place in time and geography, the mystery of where we happen to exist is great. Think of all of the other points in time we might have been born. I was born in the latter half of the 20th century; but, I could just as easily have been one of the many people born at the beginning of the 20th century, or in the 5th century of the current era, or 2000 years before the current era. I might have also been born in the year 3000 of the current era, if our world should happen to last that long. Then, there is the mystery of where I was born. I am one of the fortunate ones to have been born in a wealthy country of the 20th century. It was not a wealthy country in the 5th century but, when I happened to come along, Canada was one of the greatest countries on the planet. The good fortune of living in a country with modern medicine, plentiful food, and clean drinking water is certainly something about which to be grateful. The mystery of how this happens is astonishing. The reality is that all of us have arrived in the middle of the story. We appear at a time and a place that has been shaped by countless lives that have gone before us. We could not choose the kind of world into which we were born and there are limits on how much we can affect it now that we are here. We are in the middle chapters. It is not the beginning of the book; nor is it yet the end. Each of us finds our place in this story. Some of us work hard to find our place and make our mark. Others are content to drift with the tide of time and place. Some of the lives that have come before us have been obscure and did little to shape this time and place. Others have put a permanent mark on the world as we know it. What mark will you leave upon this planet? What is your perception of the degree to which you want to shape the world? Each of us indeed has a choice. No one is requiring us to change the world. Yet each of us has the ability to do just that. There is a principle in the book of Esther which proposes that we may have been placed in our current circumstances for a reason. This principle suggests that all of us have choices that we can freely make. When opportunities to act come our way, we may choose to do nothing while others act and have an effect on the circumstances of the day; or we may choose to see the opportunity as something for which we are uniquely prepared and choose to act with resolve. Esther 4:14 can be paraphrased, "If you remain silent at this time, relief and deliverance will arise from another place; but who knows but that you have come to your position for such a time as this?" Jesus set the book of nature before me and I saw that all the flowers he has created are lovely. The splendor of the rose and the whiteness of the lily do not rob the little violet of its scent nor the daisy of its simple charm. I realized that if every tiny flower wanted to be a rose, spring would lose its loveliness and there would be no wildflowers to make the meadows gay. It is just the same in the world of souls which is the garden of Jesus. He has created the great saints who are like the lilies and the roses, but he has also created much lesser saints and they must be content to be the daisies or the violets which rejoice his eyes whenever he glances down. Perfection consists in doing his will, in being that which he wants us to be. Jesus, help me to simplify my life by learning what you want me to be - and becoming that person. There is a humorous scene in the movie Oh Brother, Where Art Thou? in which two characters discuss the spiritual decisions made by three of the four fellow travelers. Tommy, has just sold his soul to the devil, while Pete and Delmar were caught up in an emotional moment and committed themselves to a Christian Church. Ulysses (masterfully played by George Clooney) suggests that he is unaffiliated and not committed to any particular view. Yet, his rejection of each of the options embraced by those with whom he travels is a choice in itself. He seems to be willing to simply take his chances. There may be many others who can relate to this. Certainly, I meet people who have decided to play the odds and seek to remain unaffiliated. Mary-Chapin Carpenter expresses this sentiment in her song, "I Take My Chances." But even as we cut the deck and roll the dice, most of us are aware that there is more to it than that. There is no such thing as remaining unaffiliated. Every choice we make, or refuse to make, puts us squarely in the camp of others who have chosen before us. Non-affiliation is simply affiliation with those who refuse to choose. 1 Oh Brother, Where Art Thou? Directed by Joel Cohen and Ethan Cohen. Performed by George Clooney and Chris Thomas King. 2000. Barbara Kingsolver's latest book, The Lacuna, contains a number of insights into world politics in 1930 through the early 1950s. At one point, Kingsolver gives a powerful analysis of the events that led to extreme investigations into the disloyalty and subversive activities of American citizens suspected of having communist ties. In the 1940s through 1950s, many who had even a passing association with persons with a connection to communism were fired from government jobs or blacklisted from working in education or the entertainment industry. In her novel, one of her characters describes the cause this way. "Do you want to know my theory? . . . I think it's the bomb. . . . When that bomb went off over Japan, when we saw that an entire city could be turned to fire and gas, it changed the psychology of this country. And when I say 'psychology,' I mean that very literally. It's the radio, you see. The radio makes everyone feel the same thing at the same time. Instead of millions of various thoughts, one big psychological fixation. The radio commands our gut response. . . . That bomb scared the holy Moses out of us. We became horrified in our hearts that we had used it. Okay, it ended the war, it saved American life and so on and so forth. But everyone feels guilty, deep inside. Little Japanese children turned into flaming gas, we know this. How could we not feel bad. . . . Okay. We used the bomb. We convinced ourselves we are very special people, to get to use this weapon. Ideal scenario, we would like to think it came to us from God, meant for our own use and no one else's. . . . Suddenly we are God's chosen, we have this bomb, and we better be pretty damn certain no one else is going to get this bomb. We must clean our house thoroughly. Can you imagine what would happen if England also had the bomb, France, Germany, Japan, and the Soviet Union all had this bomb? How could a person go to sleep at night? . . . You see, this is what I am saying. The radio. It creates for us a psychology. . . . Winston Churchill says 'iron curtain.' Did you see how they all went crazy over that? . . . J. Edgar Hoover says this curtain is what separates us from Satan and perhaps also the disease of leprosy. . . . 'Communism is not a political party but an evil and a malignant way of life' - these are his words. A disease condition. A quarantine is necessary to keep it from infecting the nation." As I read these words I found myself drawing connections to the events of September 11, 2001 when 19 terrorists from the Islamist militant group al-Qaeda hijacked four passenger jets and attacked America. In the 1940s, the radio had a powerful ability to shape the culture of the American people. Everyone was scared by what was broadcast on the radio. In 2001, it was television and the internet which allowed for the rapid dispersal of information and a galvanizing of public opinion. An instant fear struck America. If this can happen, what else might be possible? The internet discussions made "everyone feel the same thing at the same time. Instead of millions of various thoughts, one big psychological fixation." America was instantly in a state of fear. It was not communism but terrorism that brought fear. It was not an "iron curtain" that galvanized the thoughts into one psychological fixation but the "war on terrorism." That state of fear and security alert brought on by these events still affects our psychology today. It would be interesting to interview Barbara Kingsolver and see how much comparison she was seeking to draw between this dark period of history in 1940s America and the dark mood of 2001 in America and the world. Was this consciously in her mind or was she merely seeking to remind us of the dangers of extreme thinking? Reading literary reviews suggests that other readers have made similar connections between then and now. You may want to pick up a copy of The Lacuna for yourself and consider what connections and emotions are created for you as you read this well-written story. Kingsolver, Barbara. The Lacuna. Toronto: HarperCollins Publishers Ltd, 2009. We must be careful, however, to see the Fall also in its context as just one part of the story. Some Christians instead have interpreted our current existence as if we are in a world utterly fallen, corrupted beyond repair, a valley of the shadow of death through which we must travel as expeditiously as possible in order to reach the sunlit lands of the next life. In particular, culture itself is seen as a bad thing in the form of the city - the antipode to Eden (which is, to make this contrast work best, depicted as a "natural" place, not the garden it was, which of course implies culture). The first city was founded by Cain. Aha! That means cities are bad, and thus all human culture downstream of the Fall is bad. Yet long before the Bible set up its ongoing dialectic between the evil city (Babel/Babylon) and the good city (Jerusalem/Zion), even a little study of the immediate Biblical context suggests an interweaving of the good and the bad after the Fall. Genesis 4 proceeds from the story of Cain and Abel to show us at least two forms of cultural decline in the person of Lamech, who marries two wives and then boasts to them of his disproportionate violence, killing a man who had (merely) hurt him. Yet this Lamech fathers three sons, one of whom is the ancestor of nomads, those who dwell in tents and heard livestock; another of whom is the first musician; and the third of whom is the archetypal metalsmith. However one might be suspicious of cities, and however much one might disdain loutish Lamech, in the gracious providence of God even this family produces cultural advancement through three creative and productive sons. I have always marvelled at a creator God who could use so many flawed people for His purposes. There are many in the Bible whom I would not want to meet, let alone befriend, who are used to fulfill the cultural or spiritual purposes of God. He seems infinitely capable of meeting us at our level and redeeming some part of our lives. He has worked through history with those who have pledged their faith in Him and those who have not and still brings about growth and progress in this family of humanity. I marvel at a God who allows good rain to fall on the righteous and the unrighteous; who works with the faithful and the depraved; and allows atheists to create art and science and literature which benefits humans and other creatures on this planet. I may not like this "loutish Lamech" but I am thankful for his farming, musical, and black smithy sons. It is a good thing that He can use any one. That tells me that, despite my flaws and sin and sloth, He can still use me. 1. Stackhouse, John G., Jr. Making the Best of It: Following Christ In The Real World. New York: Oxford University Press , Inc., 2008. Tucked in a 64 year old book is a mathematical formula that gives clues about grouping procedures. Bossard1 points out that the number of people in a group may increase by simple mathematical progression, but the increase of relationships comes through geometric progression. 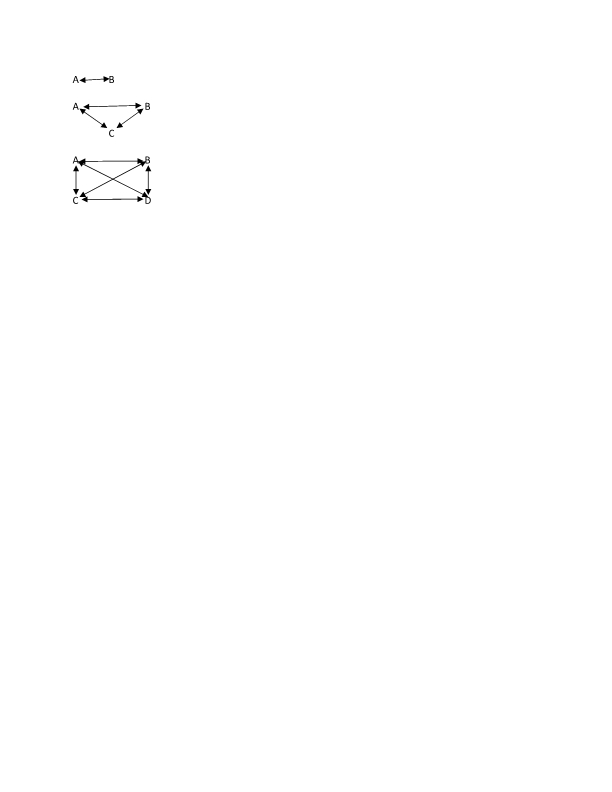 Two variables are defined. Let Y equal the number of persons in the group, and X the number of personal relationships between the members. Then using the formula X = (Y2 - Y)/2 (that is, X equals Y squared minus Y all divided by 2), as Bossard1 has, we find that the larger the group, the more disproportionate the increase in personal relationships. Note how radically the number of relationships increases with the addition of one or two people. What does this do to the individual in terms of communication, understanding, and ability to participate without pressure or frustrations? If the mathematical formula is a hang-up, try drawing the relationships on a page of paper to convince yourself of the truth of this work. See the example at the end of this blog. What implications do such formulas have for those of us who work with small groups in education or church leadership? How might we be excluding people in some of our educational contexts? We talk a lot about being communities of believers or communities of learners but this information suggests that members could easily be left on the fringe and never truly feel part of the group. The person who can entertain a large group of 1000 people may not be the best person to teach people to care for others or interact with others. Some of the goals we seek to accomplish in school or church cannot be accomplished in the size of groups we seek to use. We would be better served to restructure some of our groups so that peer learning can happen in groups of twos and threes. Neil Cole has some further insight on group dynamics in his book Cultivating a Life For God: Multiplying Disciples Through Life Transformation Groups.3 It may well be worth another look. 1 James H. S. Bossard. The Sociology of Child Development. New York: Harper and Brother, 1948. p. 146. 2 This whole section is adapted from an article by Mary Margaret Scobey, entitled "Developing and Using Classroom Groups," 1960. See http://ascd.com/ASCD/pdf/journals/ed_lead/el_196312_scobey.pdf. 3 Cole, Neil. Cultivating a Life For God: Multiplying Disciples Through Life Transformation Groups. Carol Stream: ChurchSmart Resources, 1999. 2 Kingsolver, Barbara. Small Wonder. New York: HarperCollins, 2002. 3 "Oh it's enough to be on your way; It's enough just to cover ground; It's enough to be moving on; Home, build it behind your eyes; Carry it in your heart; Safe among your own." "Enough to be On Your Way" words and music by James Taylor, Hourglass, 1997. 4 "Home...hard to know what it is if you never had one; Home...I can't say where it is but I know I'm going home; That's where the heart is." "Walk On" from All That You Can't Leave Behind, 2000, words by Bono and music by U2. 5 C.S. Lewis, Till We Have Faces. Harcourt Brace & Company, 1980. Welcome to the world little man. You have already made a mark on my life. I have become a grandfather; you a grandson. We get to explore this relationship together and I have a surprisingly intense desire to excel at grand-fathering. From a biological perspective, you and I share one quarter of our DNA. I hope you got all of the good bits. Yet, even if you did get some of my less desirable traits, you need to know that biology is not destiny. I am 52 and you are new-born. I pray that when you have experienced more of this life you will come to love life as much as I do. This world is so amazing and has so many things for you to learn and explore. I want to encourage you to never stop asking questions and never stop learning. I hope that you will become a student of the world and explore it with philosophy, science, mathematics, and theology. Never be afraid of truth; for all truth is God's truth. I pray that you will find the God who created this universe. I pray that you will have a long and happy life. I also pray that you will take risks in this life and never settle for the "safe" zone. Go ahead and make some mistakes; God knows that I have. I pray that whatever you may experience in this life, you will live it with peace, and joy, and bravery. I pray that you will go for walks in the rain and the snow; get cold and wet but love the experience. I pray that you will fight for those smaller than you; poorer than you; sicker than you; more alone than you. I pray that you will enjoy life: play music, sing, write poetry, climb mountains, drink fine wine, enjoy rich food, appreciate a loaf of bread, find love, get your heart broken, and discover a good woman to love and marry. I pray that you will appreciate the heritage of all of your ancestors who have gone before you. You have more than a little Celtic blood and even a Celtic name to go along with it. I pray that you will live with a sense of your own mortality, so that you might live well and appreciate this life. I pray that you will live life to the fullest every second of your existence in this world. I pray that you will look forward to a life beyond this one. Welcome, Clayton Keith Smith (born November 6, 2012). I saw a news story about a message in a bottle that had travelled approximately 4000 km from Gaspe, Quebec to East Passage, Ireland. The message, stuffed into a two litre plastic pop bottle had survived at sea for eight years and then been found by a nine year old boy. The girls who had set it adrift were twelve years old when they sent their note out to the world and, at twenty years old, were now surprised to hear that someone had finally found it. This story caused me to think about why people send out a message in this fashion. The girls in Quebec had seen something on television that had made them want to try this; but what about other people? Why would anyone send a message by such an inefficient method of communication. Sting, in the song he did with "The Police," says that it is about loneliness. "Seems I'm not alone at being alone." - Sting, "Message in a Bottle." The song suggests that many people have the feeling of being a lonely castaway looking for someone with whom to connect in a world filled with other lonely castaways. The movie, Message in a Bottle, starring Kevin Costner, suggests that the concept is about looking for that one person with whom we might romantically connect. Perhaps the attraction of sending a message in a bottle is about desiring to find our own message from some distant place. Is it a desire for our own unique message that will guide our lives and give purpose for our future? Some have locked prayers in tiny bottles and sent them out on the waves, hoping, with little hope, that the message might be seen by some divine being. A message in a bottle is a romantic concept. There are better ways to solve the loneliness; there are better ways to find romance; there are better ways to get a divine message. In a world of 8 billion people we need not cut ourselves off from each other or from God. I am currently guest blogging at the Cosmos website. 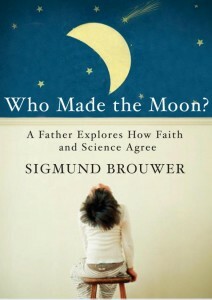 Please take a look at my review of Sigmund Brouwer's great little book, Who Made the Moon? Writers and bloggers of this world, will you hear the words of Annie Dillard? For those who have ears to hear, this is the life. I do not so much write a book as sit up with it, as with a dying friend. During visiting hours, I enter its room with dread and sympathy for its many disorders. I hold its hand and hope it will get better. This tender relationship can change in a twinkling. If you skip a visit or two, a work in progress will turn on you. A work in progress quickly becomes feral. It reverts to a wild state overnight. It is barely domesticated, a mustang on which you one day fastened a halter, but which now you cannot catch. It is a lion you cage in your study. As the work grows, it gets harder to control; it is a lion growing in strength. You must visit it every day and reassert your mastery over it. If you skip a day, you are, quite rightly, afraid to open the door to its room. You enter its room with bravura, holding a chair at the thing and shouting, "Simba!" As Dante wrote and Rodin inscribed, "All hope abandon ye who enter here." Dillard, Annie. The Writing Life. New York: Harper Perennial, 1990. I read an interesting paragraph in an Annie Dillard book. I admire those eighteenth century Hasids who understood the risk of prayer. Rabbi Uri of Strelisk took sorrowful leave of his household every morning because he was setting off to his prayers. He told his family how to dispose of his manuscripts if praying should kill him. A ritual slaughterer, similarly, every morning bade goodbye to his wife and children and wept as if he would never see them again. His friend asked him why. Because, he answered, when I begin I call out to the Lord. Then I pray, "Have mercy on us." Who knows what the Lord's power will do to me in the moment after I have invoked it and before I beg for mercy? Dillard, Annie. The Writing Life. New York: Harper Perennial, 1990, p. 8, 9. On the other hand, Stackhouse, Lewis, Niebuhr, and Bonhoeffer are not kill-joys who see only the evil and brokenness of our world. Bonhoeffer was a man who loved life and wrote books, poetry, and music. He was incredibly balanced and was not prone to extremes. These words of his show a man who loved life and knew how to appreciate good gifts from the hand of God and embrace the joy of this world. Stackhouse provides a new analysis of the traditional "categories of Christian involvement with society" presented in H. Richard Niebuhr's book, Christ and Culture. The later chapters of Stackhouse's book will provide a strategy for how we might live out a life of faith in a broken world that is still filled with joy and good gifts from God. I look forward to the rest of the book. Stackhouse, John G., Jr. Making the Best of It: Following Christ In The Real World. New York: Oxford University Press , Inc., 2008. The Thankfulness of "Why Me?" My friend Phil Reinders at Squinch reminded me of a great statement by G.K. Chesterton: "Here ends another day, during which I have had eyes, ears, hands and the great world around me. Tomorrow begins another day. Why am I allowed two?" Phil's blog reminds us that we must ask the "Why me?" question in good times as well as tragic times. I often find myself asking the questions, “How did I win the lottery of being born in Canada rather than Haiti?" "Why did I get to live in the family I did with two good parents who loved me?" I have seen enough drug-addicted single parent situations (that cannot even be called family) to know that I might have been born into one such as that. Yes, these are just as difficult "why me?" questions. G.K. Chesterton asks why he is allowed two but when I do the math I can count more than 18,000 days in which I have had eyes, ears, hands, and much more. I lost a good friend to cancer a year and a half ago. He was about 56 years old at the time; by today's standards, too young to die. A few years before that I had a miraculous experience with the disappearance of a mass on the pons of my brain. Why did my friend die while I carried on living? These are important questions that will never be fully answered this side of heaven. But I still ask these questions and as I ask them I lift up a silent prayer of thanksgiving to the One who has made me with eyes, and ears, and hands, and a healthy pons, and with the ability to ask the "why me?" question in good times and in bad. In this season of Thanksgiving, my desire is to live a truly thankful life. What do we mean when we say we are conscious? Can we explain consciousness by describing electro-chemical phenomena in the brain? How do we detect consciousness? I know that I am conscious but how can I be sure that other persons experience consciousness in a similar fashion to the way I sense it? This line of questioning led René Descartes to reduce his knowledge to the famous statement, "I think, therefore I am" (cogito ergo sum). Are dogs conscious? Are the fleas on a dog's back conscious? Could a computer ever attain consciousness? What if we were able to create human and mechanical hybrids; would they experience consciousness? This is a question often explored in science fiction characters such as "Data" in Star Trek The Next Generation or "The Doctor" in Star Trek Voyager. He calls this the hard problem of consciousness. What is that elsewhere? What bridges the gap between function and experience? Both atheists and Christians marvel at consciousness. Is this one more place where we see the that science can take us far but cannot take us all the way to understanding? Is there a God factor in consciousness? Perhaps we can only understand consciousness as we understand the image of God in us. Chalmers, David J. "Facing Up To The Problem of Conciousness." Journal of Consciousness Studies 2 (1995): 200-219. Let me express my bias from the beginning. I am a hopeless romantic who believes in the love of one man for one woman for as long as both shall live. On October 2nd my wife and I celebrated our 33rd anniversary of dating. We have now been married 31 years and in that time we have seen many ups and downs and, like most couples, there were times when we wondered if we would be able to make it and keep the love alive. Yet, through the birth of three daughters, the loss of both of my wife's parents, two university degrees, and too many stressors to count, we find that we still love being together. Recent statistics from the 2010 Canadian Census show that marriage is still a strong option for people in this country and that many marriages last for a long time. In 2008 it was estimated that 41% of marriages ended in divorce before the 30th year of marriage, an increase from 36% in 1998.1 Yet that still means that 59% of marriages last beyond 30 years. 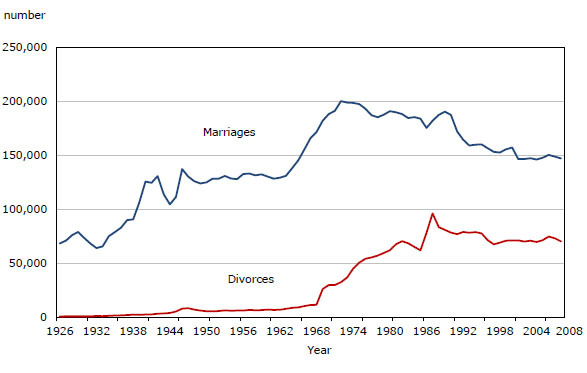 The following graph shows the raw number of marriages and divorces in Canada for the years 1926 to 2008. If we take the number of marriages in a given year, divide that number by the number of divorces in that same year, we can see some trends in the data. In 1926, there were 112.5 times as many marriages as divorces. In 1960 the ratio drops to 18.7 times as many marriages as divorces. 1970 sees a further drop to 6.3. By 1980 it is down to 3.1; dropping to its lowest in 1987 at 1.9. From 1988 to 2008, the ratio hovers around 2 (from 2.4 to 2.0). This means that twice as many people got married as got divorced in any one of those years. I will leave it to the reader to decide how optimistic or pessimistic we should be about such numbers and trends. The benefits to both the married couple and the children of such long-term marriages are great. Of course not every marriage that lasts 30 or more years is a healthy one. We can all point to examples of long-term marriages that are seriously hurting; yet we need to celebrate marriages that truly succeed. As a celebration of long-lasting love Mike Charko and I wrote a story-song about a love that lasted. We call it "Flowers." You can listen to the recording while reading the lyrics. The words of the song "Handmade" by Jimmy Rankin say, "Everywhere I go everything's plastic." I understand these words. It is all too easy to find pretense and masque all around us. Authenticity is something for which we long. We long for it in the music industry, in business, in spirituality, and in our relationships with our neighbours. We long for authenticity in our families, in our marital relationships, and in our friendships. We long for authenticity in every aspect of life. When my wife and I travelled on Cape Breton Island in Nova Scotia we saw a level of authenticity in music that is rare to find. Many cafes, pubs, and restaurants had live music. Often it was one person on fiddle and one person on a piano. The two would play music they loved and occasionally sing. Much ad lib, improvisation, and experimentation would occur. One got the impression that you were looking over the shoulders of a couple of friends who had just sat down around the family piano. Other times it might be one or two people with a guitar and other instruments and perhaps a bit of step dancing or highland dancing thrown in. The contrast to highly produced radio music coming out of Toronto and Los Angeles was stark. This East Coast music felt very authentic. Music is simply one example of an area in which we desire to see a greater degree of authenticity. Most of us would be happy to see a much greater degree of genuineness in all aspects of life. Where does such authenticity start? Of course, it starts with me. If I desire for others to be genuine with me I must necessarily be genuine with them. Perhaps that also means that I must become more comfortable with the person I am. Can I even take off the masque and look in my own mirror? If I want the world to give me something real - something handmade - something I can taste - it must start with introspection and analysis of myself. Only when I understand who I am will I be able to reveal that to others around me. Only then will I encourage this in others. Enjoy these great lyrics by a great singer songwriter. You can listen to the song here. Have we lost our style in the face of fashion? Have we lost the need and the will to care? "American Idol" and "Survivor" were certainly not the source of the concept but we can recognize that they have contributed to a sense of quick and easy fame in our culture. These television programs and many more "reality" shows have made household names out of ordinary people. Generations ago, if a person desired to become a great musician or a virtuoso singer, they would embark on years of training and disciplined practise. They would seek out one of the best schools, attach themselves to a great teacher/mentor while working hard to achieve a level of competency in their field. Today, the next "big super-star" is just as likely to come from a YouTube video, "reality show," or talent contest. Even business leaders may come from television shows like "The Apprentice" or "Dragons' Den." What impact might this be having on our culture in general and young people in specific? Can we expect people to throw themselves into long educational or apprenticeship programs that may or may not lead to wealth and fame while someone else stays at home generating YouTube videos and gets "discovered" by Usher? If it seems equally as likely that music school or one of the "Idol" programs might make you a star, isn't it better to simply show up at the long line-up for auditions and take your chances with all of the other hopefuls? Indeed, there appears to be a trend in some of the reality shows in which people who have worked hard at their craft and have been employed in the field for many years, without being noticed, are now turning to these shows as the next stage in their professional development. Thus, we see back-ground singers for Mariah Carey and Lady Gaga or former "Mouseketeers" like Tony Lucca showing up on "The Voice." These seasoned professionals take their chances right alongside people without formal training or experience; and it would seem that the professional or the novice stands an equal chance of achieving fame and fortune. What does this do to our collective psyche? Does it not, at least to some extent, create a lottery mentality about success? It suggests that one person's chances are as good as the next person's when it comes to "being discovered." It suggests that we can take the easier route and take our place amongst those recognized as something special. Who knows, I might be one of the ones who can turn my "fifteen minutes of fame" into a lifetime of celebritism. With a certain degree of irony, I draw your attention to a song written by Mike Charko and Keith Shields about achieving success and notoriety "just like that." It is a tongue-in-cheek story of one person's expectations of fame. He said, "You're gonna be a star." Going back a few years earlier we might also note the "Forrest Gump" effect on our culture. Forrest was the kind of person who just happened to be at the right places at the right times to achieve recognition. I will leave it to the reader to decide if such fables as "Forrest Gump" or "Just Like That" could happen in our contemporary times. Perhaps the present nobody-to-celebrity culture is just a passing fad, much like the wild colour schemes of the 1970s when colour television was first introduced. Perhaps our culture will return to a time when hard work and true excellence in the field will once again be recognized for what it is worth and the concept of becoming famous because everyone is looking at us will decline. Regardless of fame, fortune, success, and recognition, one thing will always be true: becoming truly good at something always takes disciplined effort and much practise. We’re often taught, in our institutes of higher learning that we can change the world. That we should change the world. All too often, those unbridled ambitions are more about us, and our own fulfilment, than they are about the world. Recreate the world in your own image. Find ways to change the world to your way of thinking, being, doing. Integrity, there is a concept worth living out. Yet, what does it mean to live in integrity with God, with one another, with our personal relationships, and with the people of the entire world? Hmm, that means having to think of others first. That might mean foregoing some of my ambitions for the sake of others in my family, in my community, in my country, and on this planet that we all share. Hmm, that doesn't sound nearly as exciting as living out my dreams and changing the world to fit my sense of justice. That sounds like giving up some of my self for the sake of others. That is not fun stuff; that is just pure, hard, sacrificial, life. Why on earth would I do that when most everything around me suggests that we are only here for a short while and then we cease to exist? Unless . . . ? It has once again become fashionable to quote Ayn Rand.1 United States presidential candidate Mitt Romney recently announced his running mate to be Paul Ryan. Paul Ryan is the United States Representative for Wisconsin's 1st congressional district who has his staff read this quote: "I swear—by my life and my love of it—that I will never live for the sake of another man, nor ask another man to live for mine. "2 It would seem that, in his mind, it is okay to ask someone else to live by his philosophy but not "for the sake of him." Other notable Rand statements include the statement that "Civilization is the progress toward a society of privacy. The savage's whole existence is public, ruled by the laws of his tribe. Civilization is the process of setting man free from men;"3 and, in an aptly titled book of essays, collectively called, The Virtue of Selfishness, Rand says, "It only stands to reason that where there's sacrifice, there's someone collecting the sacrificial offerings. Where there's service, there is someone being served. The man who speaks to you of sacrifice is speaking of slaves and masters, and intends to be the master. "4 All three of these quotes point in an individualistic and uncaring direction. "I swear—by my life and my love of it—that I will never live for the sake of another man, nor ask another man to live for mine." That is how John Galt concludes his testament, which Paul Ryan demands that his staffers in Congress read. What a frail sense of self it is that feels so imperiled by the existence of others! This monadic ideal is not heroic, it is cowardly. It is also dangerous, because it honors only itself. In his Roadmap, the intellectual on the Republican ticket lectures that "the Founders saw [Adam] Smith not only as an economic thinker, but as a moral philosopher whose other great work was The Theory of Moral Sentiments." . . . Has Ryan ever opened The Theory of Moral Sentiments? Has he ever read its very first sentence on its very first page? "How selfish soever man may be supposed," Smith begins, "there are evidently some principles in his nature, which interest him in the fortune of others, and render their happiness necessary to him, though he derives nothing from it except the pleasure of seeing it." That is the least Galt-like, least Rand-like, least Ryan-like sentence ever written. And from there the conservatives' deity launches into a profound analysis of "mutual sympathy." So much for Ryan’s fiction of the isolato with a platinum card! If there is anything that Adam Smith stands for, it is the reconcilability of capitalism with fellow feeling, of market economics with social decency. But Ryan is a dismal student of Smith, because he likes his capitalism cruel. I am no student of democracy and I would not claim to understand American politics, but I have spent a good deal of time studying and promoting community. It is quite the opposite of what is being promoted by Ayn Rand and those who would follow her. 2 Atlas Shrugged, published 1957. 3 The Fountainhead, published 1943. 4 “The Ethics of Emergencies,” The Virtue of Selfishness, p. 44. A couple of days ago I quoted C.S. Lewis regarding "wanting to act in a certain way because a first faint gleam of Heaven is already inside you." As a follow-up to that allow me to direct our attention to another quote from the same book. In this section Lewis is speaking very specifically about sexual morality. This section of the book contains a Lewis sentence that is often quoted out of context: "The only fatal thing is to sit down content with anything less than perfection." When taken by itself it has the potential for inducing guilt; but, understood in its context it is about training us in the habits of our souls. It is about wanting to act a certain way because Jesus, who died for our sins, is the one we choose to obey. Thus, we seek nothing less than perfection recognizing that when we fail, and we will fail, we have forgiveness. 1. Lewis, C.S. Mere Christianity. Glasgow: William Collins Sons and Co. Ltd., 1978, p. 91. One of the things I love so much about the writings of C.S. Lewis is his ability to write succinct, clear sentences. He has the ability to say things that I already believe yet he says them in a way I could never have said them. I read his words and think, "Yes, that is so obviously what I believe and that is the right way to explain it." A case in point would be these words from Mere Christianity. I am struck by the words, "He has begun to save you already," and "a first faint gleam of Heaven is already inside you." His words rightly put the emphasis upon the process of being saved. He does not leave room for the past tense of "saved." We are not saved; we are being saved. We are not doing things in order to be saved; we are not hoping to get to heaven as a reward. We want to act a certain way because we see the first faint gleam of heaven growing in us. We are indeed trying to obey this Jesus, whom we call Lord; and we do so because we want to. 1. Lewis, C.S. Mere Christianity. Glasgow: William Collins Sons and Co. Ltd., 1978, p. 127. Tana French opens chapter six of Broken Harbour with two paragraphs of philosophical musing by her protagonist, Mick “Scorcher” Kennedy. He reminisces about the way things were and then he states that something has changed. Somewhere along the line "we started turning feral." I remember this country back when I was growing up. We went to church, we ate family suppers around the table, and it would never even have crossed a kid's mind to tell an adult to f[***] off. There was plenty of bad there, I don't forget that, but we all knew exactly where we stood and we didn't break the rules lightly. If that sounds like small stuff to you, if it sounds boring or old-fashioned or uncool, think about this: people smiled at strangers, people said hello to neighbours, people left their doors unlocked and helped old women with their shopping bags, and the murder rate was scraping zero. Tana French is writing about Ireland but could easily be writing about Canada or the United States. We recognize a truth in Scorcher's words. There is a sense in which the broadly accepted cultural philosophies of the late 20th and early 21st centuries have led us to a more feral, survival of the fittest, mentality - with little hope. We are losing the ability to see past the immediate fulfillment of desires. We are losing the long view of a humanity which desires to improve civilization. We are losing hope. I recently saw the movie The Shawshank Redemption on television and was struck by what this film has to say about hope. At one point, the character named "Red," played by Morgan Freeman, has this to say about hope, "Let me tell you something my friend. Hope is a dangerous thing. Hope can drive a man insane." Yet, at the end of the movie, we are given a very different picture of hope. The final scene of the movie plays like a metaphor of life and death and the border between this world and heaven. Might it be this kind of hope that is missing in Ireland, Canada, and the United States? Without hope of something more than just this world and all its joys, pains, sufferings, and triumphs, might we slowly become more and more feral? Maybe for just a moment, those who have no hope in a life beyond this world could try having that hope. Put your faith in a life beyond this world and see how it changes the view. 1 French, Tana. Broken Harbour. London: Hodder & Stoughton, 2012, p. 101. 2 The Shawshank Redemption. Directed by Frank Darabont. Performed by Tim Robbins and Morgan Freeman. 1994. A young and godly woman in our church recently asked if I could direct her to some resources related to the roles of men and women in the church. She admitted to being confused by how people in the church speak of the issues. On the one hand we say that Jesus and Paul were quite revolutionary in their approach toward women. On the other hand we have Bible passages that suggest cultural constraints regarding women ought to be followed. I did my best to answer her question and I have written it up in the form of a blog that I am posting here today. Cultural equivalency is an extremely challenging topic. Let me give you a few principles, a few of my conclusions, and then a book or two to follow-up. The first struggle we have is where in the Bible we should start. If we start with 1 Corinthians 11:3-16 or 1 Timothy 2:12 and then look at other passages in light of these, we will likely have one mind-set as we come to the answers to our questions. If we start with Galatians 3:26-29 or Colossians 3:10, 11 (this passage does not explicitly mention women but taken together with what Paul says in Galatians we can see that the principles are the same) and then look at other passages in light of these, we will likely have another mind-set as we come to the answers to our questions. If we start with how Jesus spoke to the woman at the well (the very first person Jesus clearly tells that he is the Messiah), the woman caught in adultery (look at how he stoops down with her and writes in the earth - this would have been shocking for a Rabbi to get down to the level of a woman and the level of a sinner), or Mary, Martha, and other women whom he regularly discipled (women were the first to receive news of the resurrection - does this book-end the first part of Genesis where Eve is the first to sin? ), what conclusions do we make? To me, these latter places (Galatians 3 in particular) are a better place to start rather than with the words of the Bible that deal with problem people in problem churches (such as 1 Corinthians 11 or 1 Timothy 2). At the end of much study, I have concluded that, in the culture in which we live, Jesus wants women's voices to be heard in the church and in society. I believe that all leadership roles are open to men and women. I am prepared to stand before Jesus at the final judgement and say, "Lord, I have studied and tried to understand Your teaching and I have done my best to teach it to others. If I have erred, I have erred on the side of raising up all people." For further reading, I would highly recommend the following books. Finally Feminist by John Stackhouse and Christian Perspectives on Gender, Sexuality, and Community by Maxine Hancock (editor). I will also include a quote from Colossians Remixed (page 211) by Brian J. Walsh and Sylvia C. Keesmaat. In this section of the book, Walsh and Keesmaat relate how a conversation might have happened at Colossae as people read the letter to the Colossians and wrestled with the role of women in the church. Apphia remained skeptical, remarking that while women in leadership might go over in the larger metropolitan centers such as Rome or Corinth, it's a different story here in the Lycus Valley. But she trailed off as she realized that she was speaking to Nympha, not only a successful textile merchant but the leader of a house church in Laodicea, just ten miles from Colossae. Nympha pursued the point. "It's clear that Paul is undermining the structure of the household in the empire, especially in relation to slaves. We need to listen clearly to his words, for when he suggests that slaves be freed, he does so in the context of the whole household system by also mentioning both women and children. My fellow believers, you know that when we became part of this Christian community, we gave up these allegiances. You know that we all became part of a new household, which does not support the hierarchical economic structures of the empire but in which all exist for the benefit and mutual service of others. You all experienced the coming of the Spirit, promised to both old and young, sons and daughters, slaves and free. You know how Paul's teachings have challenged the very basis of our society by contradicting the emperor's edicts on compulsory marriage, by urging widows to remain single, by urging us all to choose a life free of the encumbrances of marriage.3 It is no surprise then that Paul is also challenging the basis of the paterfamilias, which the empire regards as fundamental and which we have replaced with a new household in Christ Jesus our Lord." As she paused, the older Jewish brother slowly got to his feet. "Our sister is right," he said. "We should not let our fear of the emperor keep us from following the call of our brother Paul to end these worldly structures. We have suffered for this gospel before. It may be that we will suffer again. But we are subject to Jesus, not Caesar. And we are citizens of the kingdom of the beloved Son, not the empire. "We now need to spend some time in prayer, so that we may wisely discern . . . I hope all of this is helpful. Please don't hesitate to ask me questions about it or challenge my thinking in this area. We are all learning together. 1 Romans 16:1-12; Acts 18:26; Philippians 4:3; Colossians 3:15. 3 In the Leges luliae "widowers and divorcees of both sexes were expected to remarry after a period of one month. Widows at first were expected to remarry after a one year period, but, following protests, that period was extended to three years" (Schussler Fiorenza, "Praxis of Coequal Discipleship," p. 233). Cr. 1 Corinthians 7; Paul Zanker, The Power of Images in the Age of Augustus (Ann Arbor: University of Michigan Press, 1990), p. 157.